With the end of the war came the end of rationing restrictions and the return of the millions of men and women who had fought abroad. Among them were many that had experienced first-hand the nearly miraculous job of rapid mass training that had been accomplished through the use of motion pictures and other audiovisual media. If anything, the postwar group had an even more evangelical zeal to implement the new technologies. In addition to the old claim of improved quality of learning they added the new claim of increased efficiency in accomplishing the task. The pool of trained audiovisual manpower that returned to civilian life after the war removed one of the largest barriers to the expansion of the audiovisual enterprise in schools and colleges. Their presence in the profession and the association provided a jolt of energy that accelerated the pace of change. Within a year after the end of the war, membership in DVI doubled to over a thousand. In 1945 the NEA created a new internal administrative unit, the Division of Audio-Visual Instructional Services, to provide consulting and technical services to the larger association. They offered to share the director of this unit with DVI as an executive secretary, fulfilling a dream of decades to finally have a permanent staff. Vernon G. Dameron was the first to hold this dual position, an arrangement that would last until the end of the 1960s. Dameron resigned in September 1949 and was succeeded by Herbert R. Jensen as acting executive secretary from March to September 1950 and by J. James "Jim” McPherson in September 1950. 1948-1949, F. Dean McClusky, associate professor of education and head, Audio-Visual Extension, University of California at Los Angeles (assumed presidency in June 1948 when Corey resigned to accept a new position in New York). Pressure was building to change the zonal organization dictated by the 1941 constitution. A committee was formed, chaired by Paul R. Wendt of the University of Minnesota. It recommended a new constitution, which was officially adopted in 1947. It changed the name of the association to Department of Audio-Visual Instruction (DAVI) and instituted sub-division by state rather than zone, following the pattern of the NEA. It also spelled out the responsibilities of the new position of executive secretary, enlarged the executive committee, and specified further changes in the election procedures to make the process more democratic. The necessity for teaching more and more without increasing the class period, school day, or graduation age; the futility of trying to provide meaningful learning experiences without showing that which cannot be adequately expressed or understood thru words alone/ the tragic neglect of the paramount responsibility for building better citizens of the nation and of the world by instilling desirable attitudes and appreciations thru the use of dramatic, emotionally derived learning—these are some of the vital problems which can be solved best, if not only, thru the use of audio-visual materials. Francis W. Noel, elected president in 1949 for a two-year term, faced the challenges of identifying a new permanent executive secretary (McPherson was named in 1950), regaining the association’s momentum following the dormancy of the wartime and post-war years, and responding to pressure from some members to withdraw from the NEA. Meanwhile, in the post-World War II period a new paradigm was gaining influence—the communications movement. Gradually, people in this field began to see themselves not just as visualizers, but also as designers of communication systems and the messages that flowed through them. This shift of focus gradually led to the broadening of the membership and, eventually, to the first of several "identity crises” in years to come. During this period one of the major influences on theory and practice was Edgar Dale’s new textbook, Audio-Visual Methods in Teaching, published in 1946. His "Cone of Experience” provided not only a framework for classifying the various methods and media but also a theoretical rationale for how media fit into the educational enterprise. The most popular topics in introductory educational media courses in 1947 were: selection and utilization principles, equipment operation, evaluation of materials, history and philosophy of educational media, and production of audio-visual materials (photo, non-photographic visuals, radio, and video). 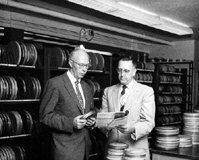 On the business side, the growth of the field and the organization was being impelled by the rapid development of educational (16mm) film libraries by school districts and universities—including Penn State, Syracuse, and Indiana—which rented films to other universities, to schools, and to other organizations on a national basis. Although these were nonprofit operations they generated large amounts of revenue that could be reinvested in adding to the collection and in providing other services. By 1951 another constitutional revision was adopted, with the primary intent of making the organizational structure more efficient. It specified a new Board of Directors, the composition of the executive committee, and detailed provisions for the succession of new officers. To the Board it granted sweeping powers over policy, procedure, finances, and personnel, and it empowered the executive committee to act for the Board in the intervals between Board meetings. It also encouraged the affiliation of subgroups at the state, regional, and national levels. Eventually there would be audio-visual education associations in virtually all the states, affiliated with DAVI. The basic structure laid out in the 1951 turned out to be sufficiently robust that the framework in place in 1999 still resembled that of 1951. Membership dues were raised to $5 at this time. This still entitled members to a subscription to The Educational Screen, which continued to carry association news and transcripts of major convention presentations. However, discussion continued concerning the establishment of a professional journal of DAVI’s own. Another watershed occurred in 1952 when for the first time the DAVI national convention (pdf) departed from the traditional cycle of NEA semi-annual meetings—the summer convention of the whole NEA and the winter meeting of the American Association of School Administrators (AASA). Instead, DAVI met in the spring with the National Audio-Visual Association (NAVA), which was the trade association representing AV manufacturers and dealers, and the Educational Film Library Association (EFLA). The following year, after serious deliberation, DAVI added a commercial exhibition to the convention. This had been taboo since the founding of the organization due to sensitivity to charges of "commercialization.” AV people were in the business of promoting the use of audiovisual media in schools and colleges, but they did not want to be perceived as mere shills for commercial products. In any event, the 1953 convention in St. Louis featured 41 exhibits. This number grew year by year, reaching over 300 by the early 1970s. Indeed, commercial exhibits fees became a major revenue stream, eventually outpacing even membership dues. As the association became more and more dependent on this revenue stream, some members began to fear that the trade show was becoming the tail that wagged the dog, with the educational sessions being eclipsed by the exhibit hall. 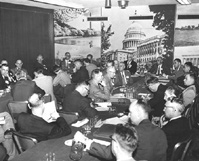 From 1953 to 1956 the convention format settled into a pattern that would persist for the rest of the century: an opening reception, meetings of national committees and other governance groups, a few (two to six) general sessions, many concurrent educational sessions, workshops, field trips, commercial exhibits, and a closing social event. There were also sessions organized by other autonomous, affiliated organizations. On the informal social side, this was the era in which hospitality suites ruled the night. Dozens of companies, especially educational film distributors, hosted hospitality suites in conference hotels. These often featured open bars and hors d’oeuvres, sometimes running to the lavish. Delegates’ exchange of information about the comparative virtues of their favorite hospitality suites was a major conversation topic. Right from the beginning, the convention also served as a common meeting ground for other organizations, which arranged their national meetings to coincide with the DAVI convention. The earliest national affiliated organization was the Association of Chief State School Audio-Visual Officers (ACSSAVO). This organization was composed of the person from each state education department who was responsible for overseeing educational media operations. Its purpose was to explore and improve the role of state education departments in advancing the use of media in the schools. Over the years their concerns ranged from audiovisual materials to educational television to teaching machines, and even to computers in some states. ACSSAVO flourished between 1953 and 1973 before it withered away with the cutbacks in federal and state funding precipitated by the national recession of the early 1970s. The dream of a journal published by DAVI came to fruition in 1953 with the publication of the inaugural issue of Audio-Visual Communication Review. The editor was William Allen of the University of Wisconsin; the advisory editors were other luminaries in the field: Edgar Dale, Charles F. Hoban, (the son of Charles F. Hoban, senior, who was president of DVI in 1932) James D. Finn, Elizabeth Golterman, Kenneth Norberg, and Paul W. F. Witt, in addition to J. James McPherson, the executive secretary. The first issue featured articles by Dale, Finn, Norberg, Hoban, and C. R. Carpenter, each of which was an original and important contribution, some of which were still remembered and quoted in the 1990s. Three subsequent issues of AVCR came out quarterly for the rest of 1953, and then continued for the next four decades (under a succession of titles (pdf)), still going strong through the end of 1999. 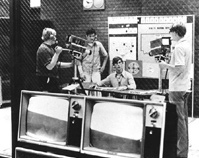 The content of those first issues gives a snapshot of the major issues in the field at the time: communication theory and the communication process, perception principles, instructional film research, teacher use of audio-visual (AV) materials, presenting information in diagrams, and television in education. AVCR was at its inception devoted to research and theory, and retained that focus thereafter. It spoke primarily to the professors among the membership and was not perceived as very relevant to the members who worked in school settings, few of whom paid the extra subscription fee. Membership continued to grow, reaching 3000 in 1955, as the Baby Boom generation went to elementary school, necessitating a national school construction boom. With new, modern schools came new, modern technology, with classrooms now being outfitted with electrical outlets at the front and back, permanently mounted projection screens, and shades or blinds for room darkening. Of course, as new hardware and materials were being installed there came a demand for technical and pedagogical support, which was provided by the building and district audio-visual coordinator. It was the growth of this job category that provided the life’s blood for new membership in DAVI. Much of the credit for the growth of the association was given to J. James McPherson as executive secretary. As with other executive secretaries during the long NEA affiliation, his salary was paid fully by the NEA, but he worked eighty percent of the time for DAVI. A strong leader, he laid the foundations of the independent convention, new periodical publications, and an active program of non-periodic publications. This was a crucial period for the development of educational television. In 1952, after much deliberation, the Federal Communications Commission (FCC) issued its Sixth Report and Order, which reserved 242 television channels for non-commercial operation. In the following decade, school districts, universities, and many community-based groups received licenses and gradually took to the air. Before 1953, DAVI conventions still gave more consideration to radio than television, and what conversation there was about television focused on the issues of getting stations up and running. After 1953 the conversation shifted to developing programming and teacher utilization, but other organizations, such as the National Association for Educational Broadcasters (NAEB), became the venue for the business of non-commercial TV. The most popular topics in introductory educational media courses in 1957 were: equipment operation, selection, utilization, and evaluation of materials, history and philosophy of educational media, and production of audio-visual materials (photo, non-photographic visuals, radio, and video). 1956-1957, L. C. Larson, Director, Audio-Visual Center, Indiana University. Since its inception as DVI, the association had tended to function as a special interest group that came to life only during face-to-face meetings at semi-annual conventions. But with the addition of a national staff and a growing membership, a more sophisticated mode of operation evolved during the 1950s. Under the leadership of J. James McPherson and his assistant, Anna L. Hyer, a strong committee structure was built. The interests of the organization were embodied in fourteen committees in 1951, expanding to 34 by 1957. These committees conducted business throughout the year, coming together at an annual convention to display their accomplishments to the general membership. By the late 1950s DAVI had evolved into the sort of organizational pattern it was to retain with minor alterations for the rest of the 20th century.